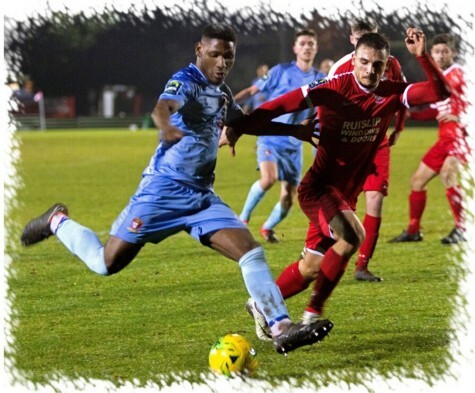 Despite missing six potential starters at the Acretweed Stadium, Paul Hughes’ Hayes & Yeading side came home with maximum points to maintain the 12 point lead at the top of the Bostik South Central table. 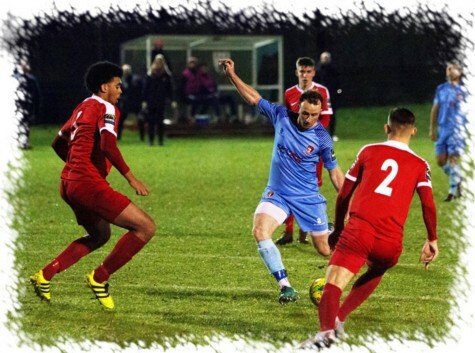 Manager Paul Hughes’ squad was stretched to the limits as injury and work commitments meant that Roddy Collins, Elliot Benyon, Josh Chamberlain, Nick Elliott, Tom Jelley and Duncan Culley were all unavailable for the visit to nearby Northwood. The squad for the evening was enhanced by two recent arrivals in the form of defender Ashley Smith and midfielder Jeevan Panesar. On a damp night the opening 10 minutes saw very little in the way of goalmouth action as both sides looked to be sizing each other up and then as has happened a lot this season, United struck early. With 12 minutes on the watch, Ash Nzala won possession from a defender in the Woods area, he made for the bye-line before pulling the ball neatly back to Lee Barney who took a touch before curling home from 12 yards out for his 30th strike of the campaign. 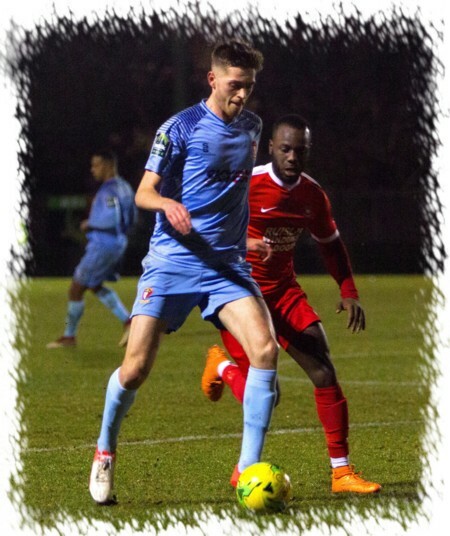 Within a minute United almost had another, Barney collected wide on the right wing and fed it back to the on-coming Ashley Smith, the former Egham Town player-manager letting fly instantly only for his shot to fly across the Woods goal and inches wide of the far post. At the midway point of the half a long punted clearance by the home side found Trey Charles on the right side, the wide man collected the ball well and cut inside only to fire weakly at Charlie Burns in the United goal from just outside the box. We were now past the half hour mark and skipper Scott Donnelly fed the ball left to Toby Little, United’s free-scoring wing-back cut back inside onto his supposedly weaker right foot and hit a shot that Woods ‘keeper Luke Sheldrick initially fumbled but he was alert enough to grab the loose ball as United boots closed in. A goal up and on top possession wise, United continued to push for a vital second. Barney collected and sent Smith away on the right flank, his low centre found Nzala who worked space for a shot only for a defensive block to ricochet back off the striker into Sheldrick’s arms. Scott Bridges, Callum McAllister and Donnelly played a neat interchange in midfield with the latter finding Little in the box on the left but his shot was deflected wide for a corner. 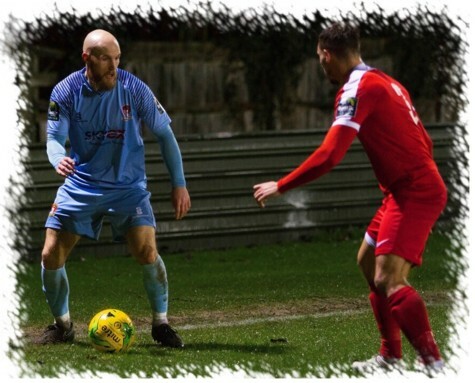 Donnelly’s flag kick was returned back to the United skipper who curled a shot over everybody in the middle and with Sheldrick stranded it needed a defensive header off the line to deny Donnelly an eighteenth of the season. That denial only lasted three minutes however, a quick throw-in on the right was creatively dummied by McAllister leaving the ball to Donnelly who struck a perfect dipping volley from 25 yards that flew over Sheldrick into the Woods’ net and United went in two ahead at the break. Seven minutes after the re-start Smith found himself out on the left side and collected a part cleared set piece, his cross was met by a stooping Little who saw his header go just the wrong side of the upright. Just past the hour mark Nzala collected the ball in the Woods box, turned between two defenders and got in a shot that was held by Sheldrick. A minute later United should have been almost out of reach, Little found Donnelly on the left of the Woods box, his low centre picked out Nzala who looked certain the make it three only to take his eye off the ball at the vital moment, kicking air, he did quickly regain possession though with his follow-up shot being blocked out by Sheldrick’s legs as far as McAllister who saw his shot blocked in front of goal as the Woods scrambled the ball to safety. With twenty minutes remaining Nzala’s run set up a chance for Bridges that Sheldrick grabbed at the second attempt and then out of the blue a minute later the home side got themselves back in the game with a “worldy” of their own to match Donnelly’s earlier as Zaied Sabti hit a dipping shot from fully 25 yards that flew into the United net beyond the despairing dive of Burns who just could not reach the shot despite being at full stretch. Within a minute Sheldrick was tested once more, Nzala fed the ball to Smith 20 yards out, the debutant’s goalbound shot being pushed around the post by Sheldrick. The final chances again fell to United, Bridges nutmegged his marker on the left of the box, his low shot was blocked back to McAllister who saw his follow-up held by Sheldrick. In stoppage time substitute Rylan Myers and Little combined on the right side, the latter’s effort being caught by Sheldrick as the United man tried to chip home from an acute angle. The second half in reality was not as one sided as it appears above with the home side having as much time on the ball as United but they found the reconstituted United defence in fine form making goal chances very much at a premium for the hosts whose own defence did well against a United attack that is rapidly approaching 100 league goals for the campaign.